Samsung is gearing up to launch multiple new smartphones in the refreshed Galaxy A-Series that are expected to come with features such as in-display fingerprint sensors, Infinity Display panels, and dual or triple rear cameras. Details of two upcoming smartphones in the series, the Galaxy A50 and the Galaxy A10, have been leaked yet again, suggesting that the Galaxy A50 will pack an Infinity-V display and a triple rear camera set-up. The lower-end Galaxy A10 has been spotted on Geekbench again running Android 9 Pie and powered by an octa-core Exynos processor. Among the nine upcoming Galaxy A-series smartphones Samsung is expected to launch this year, the Galaxy A50 appears to be the mid-range offering among them. The device, which has reportedly received the Bluetooth certification, has now seen its internal design get leaked in live images by 91Mobiles. 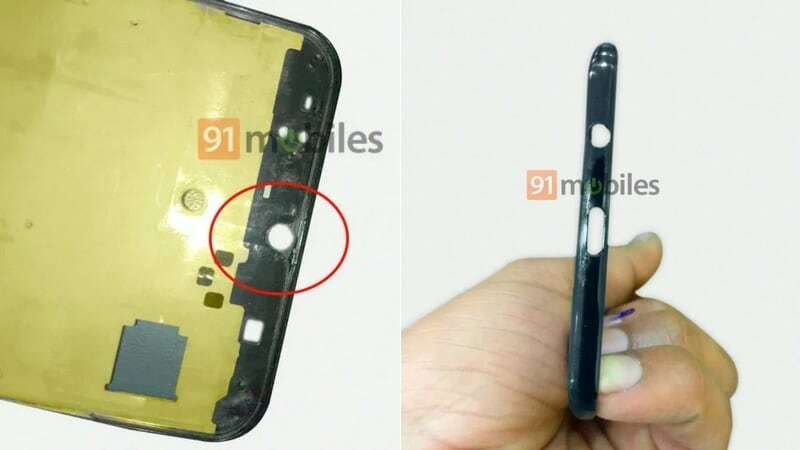 The leaked image of the Galaxy A50’s chassis also indicates that the upcoming smartphone will feature a USB Type-C port and will also retain the 3.5mm headphone jack. As per the hands-on images, the Galaxy A50 will sport an Infinity-V Display – a design element that will reportedly be a mainstay on all upcoming smartphones in the Galaxy A-series. The other, but more important piece of information, revealed by the latest leak is that the chassis shows an elongated cut-out for the rear camera setup that will reportedly accommodate three sensors. A previous leak has already revealed that Samsung will equip the upcoming Galaxy A-series smartphones with dual and triple rear cameras alongside a ToF 3D sensor, which means the new leak appears to have some substance to it. Moreover, there is no cut-out for a physical fingerprint sensor, which adds more fire to the rumours that the Galaxy A50 will flaunt an optical in-display fingerprint sensor. Not much is known about the Galaxy A50’s hardware except for rumours and speculations which claim that it will be powered by the Exynos 7 9610 octa-core SoC paired with 4GB of RAM and 64/ 128GB of inbuilt storage while a 4,000mAh battery will keep the lights on. Another upcoming Galaxy A-Series smartphone, the Galaxy A10, has been spotted on Geekbench yet again. The Galaxy A10, carrying the model no. 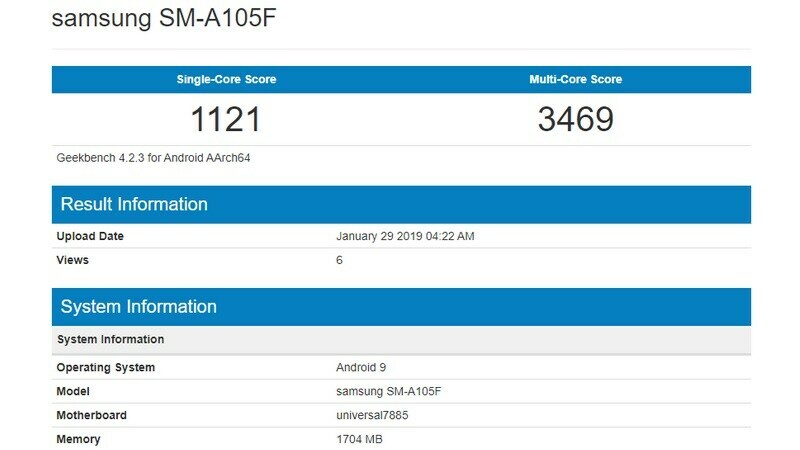 “Samsung SM-A105F”, was spotted running Android Pie on the benchmarking platform, powered by Samsung’s octa-core Exynos 7885 SoC paired with 2GB of RAM. Nothing much is known about the upcoming smartphone’s internal specifications, but if previous leaks are anything to go by, the Galaxy A10 will reportedly come with an LCD display and will sport an under-display fingerprint scanner.